The final book in the Kamas Trilogy begins one year before the Kamas revolt. A veteran intelligence officer with the Department of State Security is accused of sabotaging an undercover operation in Beirut against exiled political opponents of the President-for-Life. Sent to die in an arctic labor camp, he undergoes a change of heart and decides to redress past wrongs. Beirut, 2023. One year before the Kamas revolt. When undercover intelligence officer Warren Linder agrees to lure an exiled opponent of the President-for-Life back to impoverished, low-tech, post-Civil War II America, Linder is unaware that the target is his childhood sweetheart’s father. On learning this, he ignores his better instincts and plunges ahead. But a surprise encounter with the woman who rejected him years before triggers a change in Linder that derails the operation. His superiors, suspecting treachery, capture Linder along with the target and his daughter and spirit them back to the U.S. aboard a secret rendition flight. Linder’s ensuing journey takes him from Beirut to a Virginia interrogation center and on to an arctic labor camp; then, after a nearly impossible winter escape, on a 2000 mile trek to the Utah Security Zone, where his onetime love was last held. Though he finds her, their respective ordeals have changed them. The story reaches a climax in the couple’s home town of Cleveland, where Linder aims to recover his former target’s last cache of rebel funds and use it to take his loved ones beyond the regime’s reach. 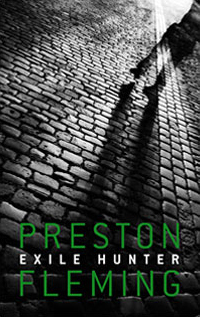 EXILE HUNTER is a tragic yet life-affirming saga of a man who risks everything to set right past wrongs, regain lost love and resist the tyranny he once served.